Only this lovely villa’s gardens are available to the tourist, unless you decided to sign up to stay at the hotel here too (it’s Bellagio’s only 5-star deluxe hotel). Still, the gardens alone are worth visiting. The magnificent grounds cover over 18 km of avenues and paths filled rare and exotic plants growing on terraces that slope down to the waters. Also, the views are terrific over the lake (check out the fortifications on the top of the promontory). Tours can be cancelled on days of bad weather. Reduced prices may be available for groups of 20-30. Free for under 7 year olds. Each guided tour lasts 90 minutes; happens twice a day. The garden park can only be visited during the 90 minute guided tour (minimum 6 people, maximum 30 people). 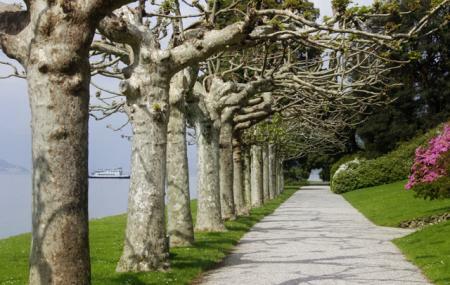 How popular is Villa Serbelloni Gardens? People normally club together Villa Del Balbianello and Bellagio Water Limousines while planning their visit to Villa Serbelloni Gardens.